Like architecture, water, or nature? 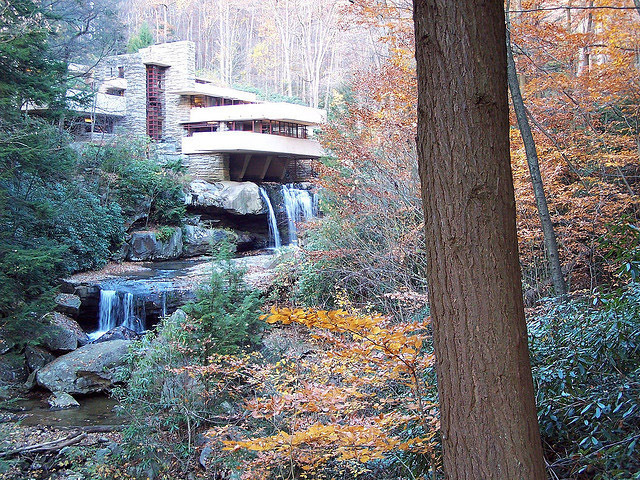 Come see all three combined at Frank Lloyd Wright’s masterpiece, Fallingwater. Located in Southwestern Pennsylvania’s Laurel Highlands, Fallingwater is a house built atop a waterfall. The house looks like it floats on top of the 30-foot waterfall, but is actually a cantilever design made of concrete. The multi-level structure is the ultimate nature retreat. You can hear the waterfall rushing under the house, and watch the outdoors through the huge windows. The house incorporates nature into every detail, from a spring-fed swimming pool to a fireplace made from boulders. Where is it? About an hour and 20 minutes outside of Pittsburgh. Where to stay? At another Frank Lloyd Wright-designed place, Polymath Park Resort, located nearby. Book the aptly named Dream House (designed by a Wright apprentice) for only $425 for three people! What else should I know? Don’t plan on making this a spur-of-the-moment stop. Advance ticket purchase and reservations are strongly encouraged, and be aware that Fallingwater is closed during most major holidays and in January and February. Who’s it for? Architect-aficionados, nature-lovers, Frank Lloyd Wright followers.